Try if you can to Climb the Ladder. 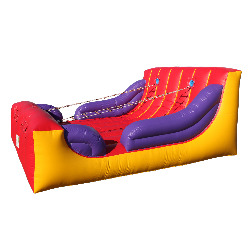 Also known as Jacobs Ladder Inflatable at carnival game booths, this inflatable is a challenging attraction that always draws a line of eager participants wanting to test their skills. Whether riders challenge themselves individually or turn it into a race, Climb the Ladder is a fun game for everyone to try over and over again. Climb the Ladder is a fun game for carnivals and festivals or large family gatherings that look to have a variety of attractions for guests to keep the fun moving. It is also a hit at fundraising events as it makes ticket sales a lot easier. Challenge your party to keep their weight balanced as they race to the top of the ladder climb.